LAND OF MISSING MEN (1930, Tiffany) Bob Steele, Al St. John, Caryl Lincoln. Bob and Al drift into a lonely tavern and find everyone dead or dying from an attack by bandits. One of the dying men tells of a plot against his daughter. Soon Bob and Al are headed for the high desert badlands, trailing the killers. Some great facial close-ups are complemented by breath-taking longshots of the Vasquez Rocks area. Bob (with a week’s whiskers on his face) really looks like a tough, steel-nerved cowboy. It may be an early talkie, but this gritty western has lots going for it. From 16mm. 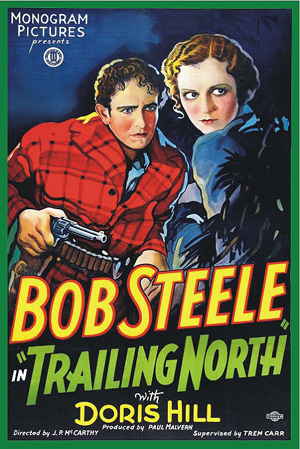 TRAILING NORTH (1933, Monogram) Bob Steele, Doris Hill, Arthur Rankin, Gabby Hayes. Bob’s ranger pal is shot and mortally wounded by bandits. As he dies, he tells Bob that when he finds a woman named “Mitzi,” he will find the killer. Bob heads north to run down the killer and avenge his pal’s death. There’s a great, climatic twist in this fine entry in Bob’s Monogram series. Recommended. 16mm. TOMBSTONE TERROR (1935, Supreme) Bob Steele, Kay McCoy, Gabby Hayes. One helluva B western! Bob plays twins, one good, one bad. Good Bob impersonates bad Bob (who has skipped town) and learns his no-account twin is part of a crime ring! One funny scene has good Bob agreeing to get hitched to bad Bob’s gal. She can’t tell them apart! When bad Bob returns, the fur really flies. An incredibly raw, bloody fist-fight between Bob and a barroom thug is one of the film’s highlights. Bob never had so many gorgeous dames falling all over him. Great stuff! 16mm. SMOKY TRAILS 1939, Metropolitan) Bob Steele, Jean Carmen, Ted Adams. A bitter Bob vows at his father’s graveside to avenge his murder. Later, while tracking the killers, he comes to the aid of a rider being chased by thugs, unaware that the man is his dad’s killer and the riders are lawmen. This is probably Bob’s best film for Metropolitan. From 16mm.